← We’re a Speakeasy finalist! 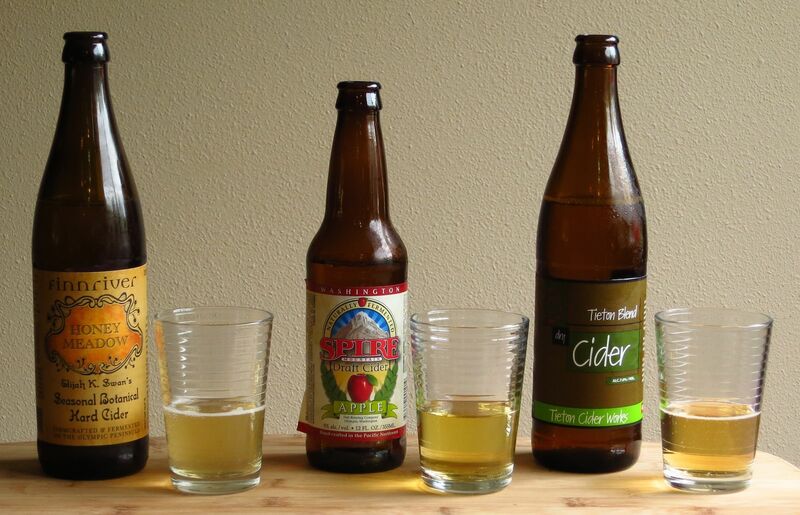 This week we decided to do some tasting with various ciders. We went to our local mega-mart and picked up a selection of hard apple cider, several of which are from WA and a couple of which aren’t (we do have an amazing hard cider industry here in WA and OR!). And because we’re all about the cocktails around here, we decided to try cider in a few original cocktails as well as a substitute for sparkling wine. Read on for our tasting notes and some tasty drinks. First up, we tasted each cider on its own. Nose: Fresh sweet apple, sweet sour green apple (like Jolly Ranchers). Palate: Like very light, fresh apple cider with a bit of a bite. Light, clean, apple-y, mildly sweet, not very complex. Not strong enough to stand up to mixing, in our opinion. Slight cereal aftertaste like beer. Nose: Fresh apple, honey, strong molasses notes as it warms up. Palate: Molasses and cooked apple. Sweet and full bodied. Good strong apple flavor. Sweet molasses cookie flavors that get stronger as it warms. Might pair well with rum. Nose: Sharp yeast, little touch of vinegar, sour apple, apple peel. Palate: No residual sweetness, very dry. Clean mineral notes. Little bit of vinegar acidity and yeast. Faint but not unpleasant bitterness. Closest to a champagne, possibly also a good substitute for a dry vermouth. Nose: Hay/grass, yeast notes, dusty minerals, apples, faint herbal notes. Dusty mineral-ness increases as it opens up. Palate: Very different. Sweet apple, creamy oatmeal and a little bit of hay to start. Maple syrup and apple on the mid-palate. Dusty mineral notes on the end. Palate: Somewhat barn yard-y. Moderately sweet, light bodied. Little bit of smoke on the mid-palate along with sweaty horse tack (no, seriously!). Slight bitterness on the finish. Nose: Funk, yeast, dried apples, peanut brittle. Slight medicinal quality, underlying earthiness. Palate: Very funky, very yeasty. Slight tannic notes (like unripe apple), light sweet honey, and chamomile on the front. Touch of stone fruit, like peach, at the end of the mid-palate, then some green herbal notes, followed by fine, clean acid. Moves from slightly sweet to slightly sour from start to finish very nicely, nothing overpowering. Strong acid backbone throughout. Acidity picks up as it warms up. 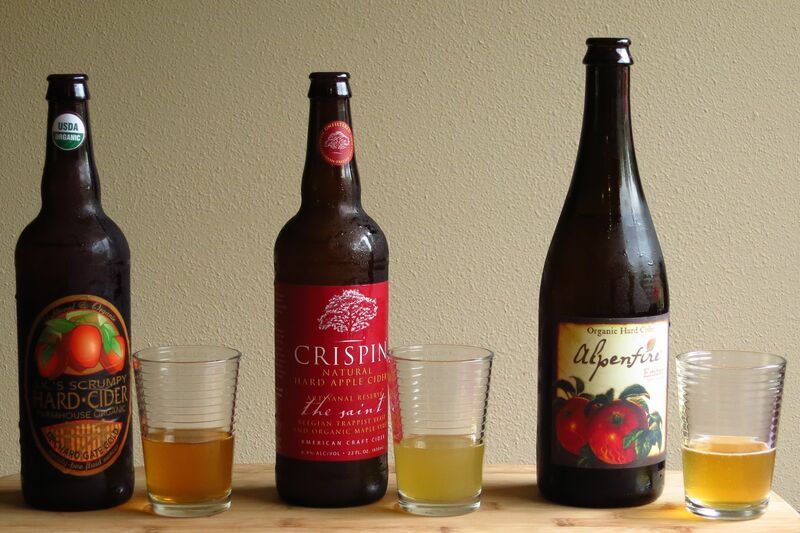 Six very different ciders. It’s always very interesting to us how something as simple as fermented apple juice can create so radically different flavor profiles. With that in mind we decided to try a few of them in some cocktails. We felt that the Tieton cider would make a good substitute for a dry sparkling wine. Therefore we thought we’d try it in a French 75. We have several gins in house (34 at last count) so we tried several to see which one would work best. Eventually we settled on the Greenbrier as it’s fairly elegant and restrained so it doesn’t overwhelm the cider. Shake first three ingredients with ice. Strain into a champagne flute. Top with dry cider. Garnish with a brandied cherry. Nose: Lemon, yeast, herbal notes of the gin. Mineral notes. Palate: Quite nice. Sweet lemon on the intro, then dries out nicely. Then gin botanicals, little bit of yeast, little bit of apple on the mid-palate. Little bit of citrus, nice dry mineral finish. Very nice substitute for sparkling wine. We found the Finn River Honey Meadow and the Alpenfire Ember to be very interesting and unique. Therefore we figured they’d be challenge for mixing. We weren’t disappointed. We settled on the Honey Meadow seen as we figured that the strong notes of the Alpenfire would just be too overwhelming for anything we tried to mix with it. 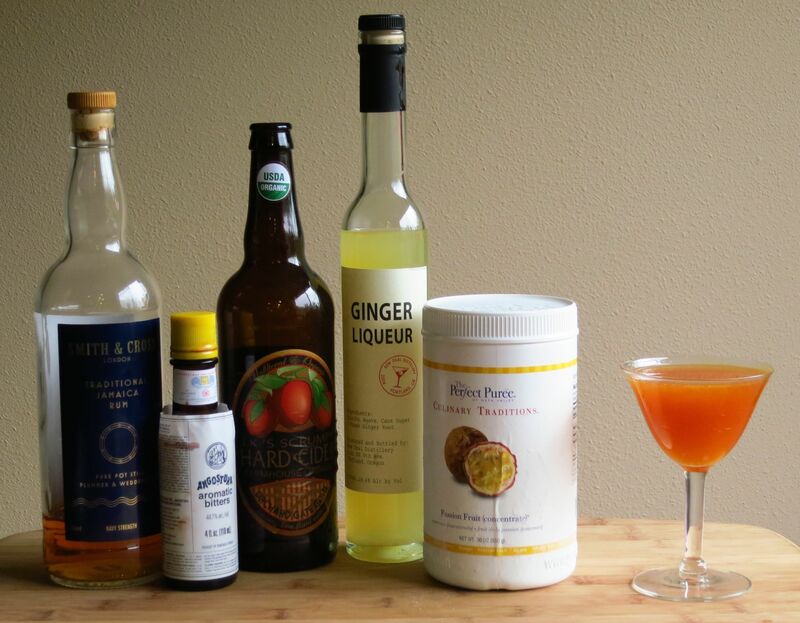 We really enjoyed the more herbal notes of the Honey Meadow and figured that a nice herbal liqueur would work well. We also felt that the grape must notes of pisco or grappa would work well. 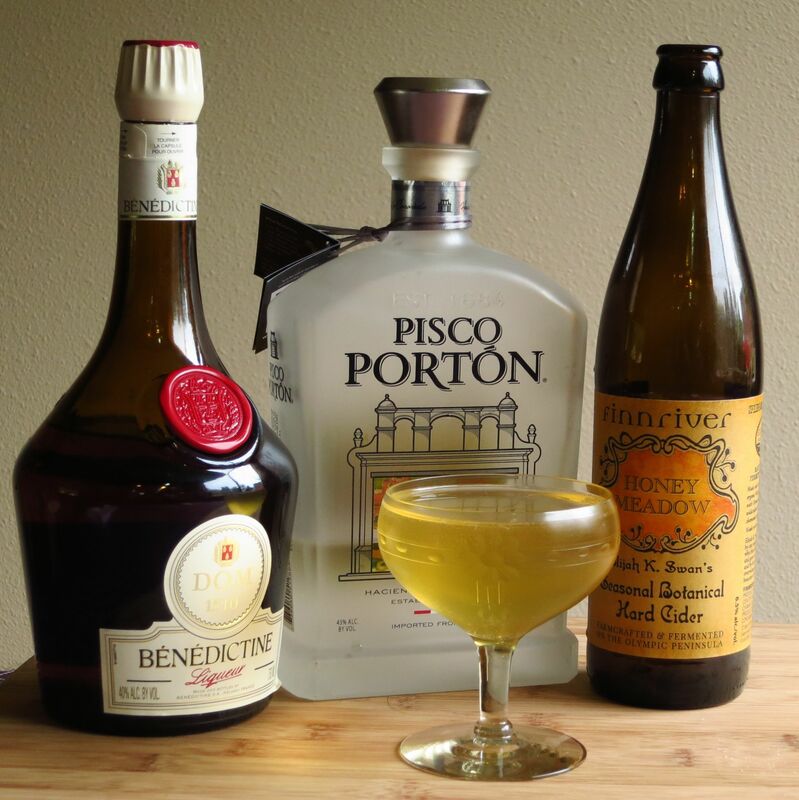 After trying both we settled on pisco which we felt worked very nicely and created a unique drink. Stir first 3 ingredients with ice. Strain into a glass. Top with remaining ounce of cider. Nose: Grape must of the pisco, herbal notes of the Benedictine, trace of hazelnut. Little bit of honey and funky yeast notes. Palate: Sweet apple and fermented, musty grape on the intro. Astringent herbal notes and yeast on the mid-palate balanced by honey and caramel. Finish dries out quickly. More bitter than expected. Shake first three ingredients with ice. Strain into a glass. Top with cider. Float ginger liqueur on top. Nose: Jamaican rum, passion fruit, ginger, yeast. Little bit of petrol notes from the rum. Palate: Elegant sweet/sour notes, more restrained then typical in a tiki drink. Doesn’t bite as strongly from the acid. Melds together better and has a little bit of dryness to finish. Ginger on the front along with molasses and apple. Rum and passion fruit on the mid-palate. Dries out on the finish. Spiciness from the bitters, yeast notes from the cider, and finally a little bit of heat from the ginger as it winds up. All six ciders were very unique and interesting. Mixing with them proved very rewarding and definitely added some interest to the cocktails. 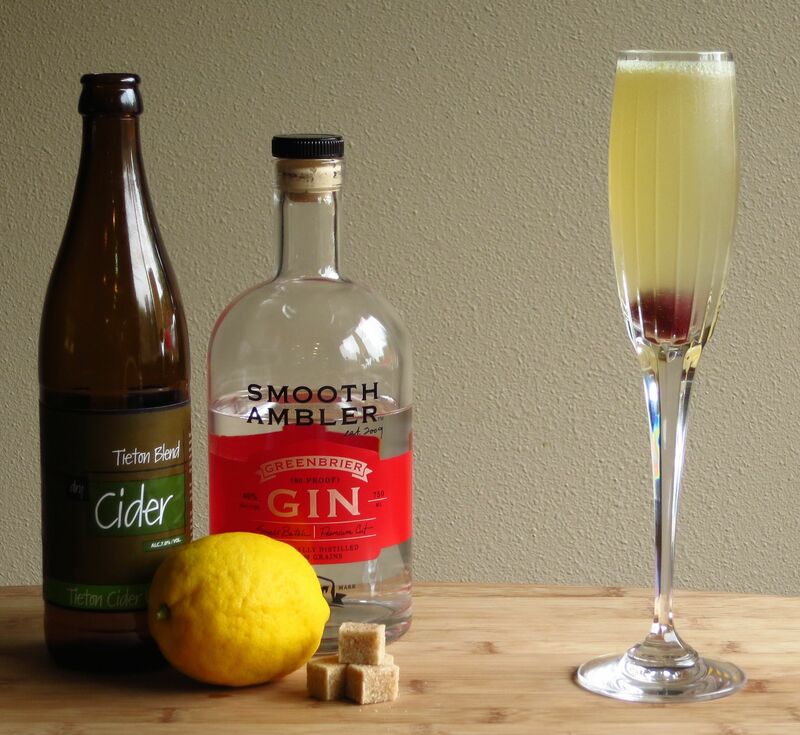 We suggest you try experimenting with cider as a substitute in your favorite sparkling wine cocktail, or throw together some of your own creations. In case you missed it, we’ve been selected as a finalist for the Slow Foods Speakeasy competition. 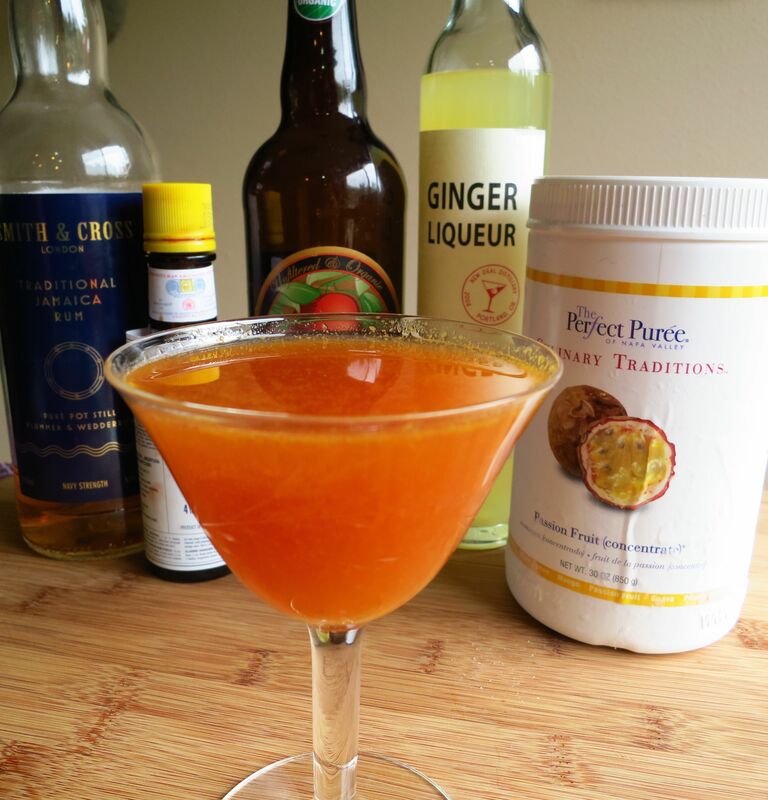 Please vote for Christa Carpentiere and the July 5th cocktail! 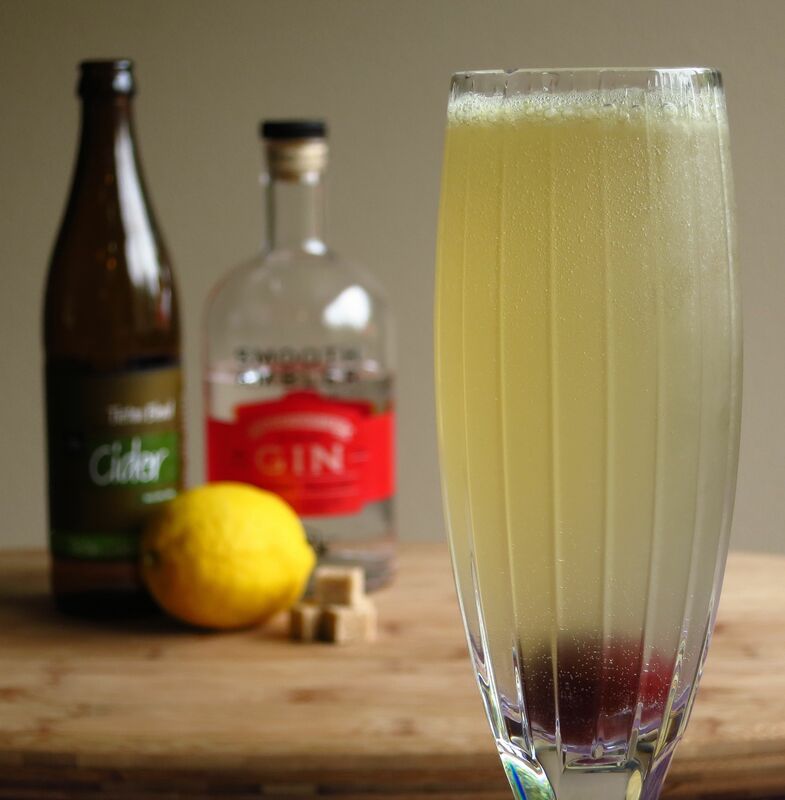 This entry was posted in benedictine, cider, gin, ginger liqueur, jamaican rum, pisco and tagged french 75 cocktail recipe, new deal ginger liqueur, pisco porton, smith & cross Jamaican rum, smooth ambler greenbrier gin, tieton blend cider. Bookmark the permalink.